Life is a challenge when you’re born with limited or no vision, but what about when you lose this pivotal sense later on in life? Whether it happens in a single moment or over the course of time, the impact will rock your entire way of living. You’re thrown into a brand new world where you’re forced to figure out life after sight loss. It happened to Derek Daniel. His story became the seed that grew his career consisting of podcasts, YouTube channel, and personal coaching. Driven by empathy and the ability to help others adapt and even thrive with their disability, he made it his life’s purpose to be a helping hand. Growing up, Derek was an active teen with a love for theater and entertainment. In fact, he was working at a theme park performing as a singer and dancer when he lost his sight at the age of 18. The cause was a rare genetic disease called Leber’s Hereditary Optic Neuropathy, or LHON for short. Over the course of the following months, he saw an irreversible decline in his eyesight until he became legally blind. But Derek isn’t the type to lie down and give up. Instead, he set it upon himself to learn how to navigate and enjoy life even without his vision. His experience became the foundation for Life After Sight Loss, which is a series of media talking about the emotions, challenges, and tricks to adapting to a blind lifestyle. 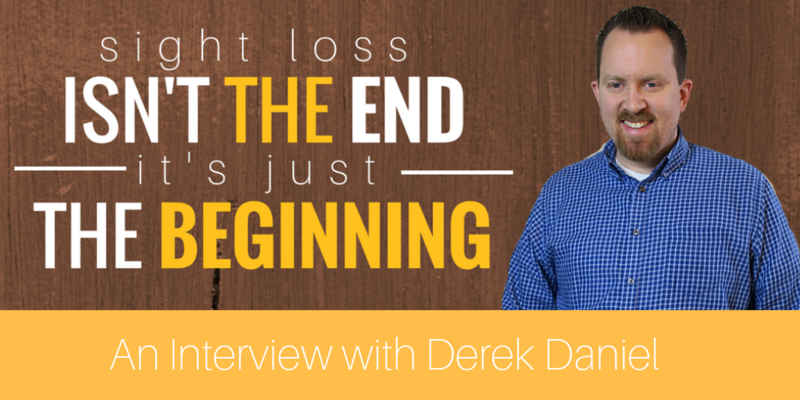 Derek is an admittedly external person who finds talking through his experiences therapeutic. Combining that desire with his interest in recording, he began a podcast, then videos, as an cathartic outlet. However, his story and his insight soon connected with other people, growing into something bigger than just himself. “I realized my story coincided with so many other peoples’ stories,” Derek said. “Whether it was the same disease or not or we lost our sight at the same time or not, we had things in common. I didn’t intend to grow into some big YouTuber or anything like that, I just had knowledge that I could share with people.” Yet his knowledge and empathy was exactly what many people across the world were seeking. People wanted to connect with others who knew and understood their struggles and experiences. “People like the emotional part because it gives them permission to talk about it,” he explained. “If you don’t have people to say ‘I understand,’ and really mean it, it’s difficult. To have someone sit across from me and share stories I understand and for them to get it and for me to get it on their side as well, it’s infinitely important.” Seeing the need for a platform and resource like Life After Sight Loss, Derek made it his full-time career to create helpful content for others like himself and offer coaching to help low-vision individuals and families adapt to their new world. Life after sight loss isn’t something you adapt to instantaneously. It’s an ongoing learning process. During that time, it’s okay to struggle and have bad days. “The cliche is always that it’s not the end of the world,” Derek said. “What I always tell people is it is the end of something, and I think they need to hear that. Your life as you knew it, every day, in and out, isn’t going to be the same. You’re going to interact with things differently so it’s okay to be in that mode of grief.” However, you don’t want to linger there. Your life has changed, but it isn’t over and it hasn’t dwindled. The key is to build a strong support system, and to connect with a community that understands what you are going through. “The most important thing I can tell people is that they’re not alone,” he pressed. 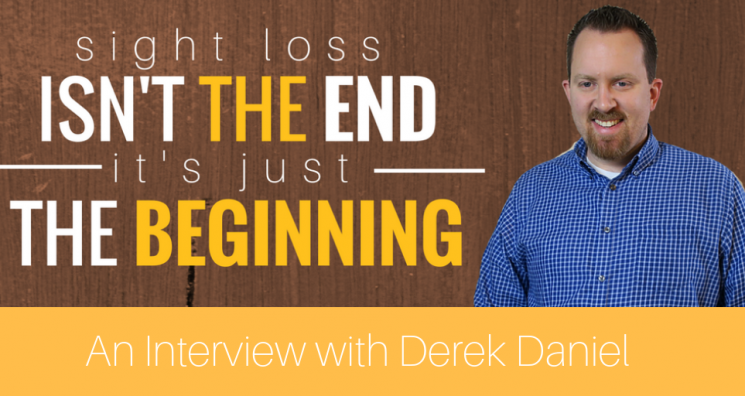 “There are many people out there going through the same things.” Derek has a multitude of podcasts, videos, and resources available on his website at https://lifeaftersightloss.com. Whether you recently lost your sight or you’re simply looking to understand what life is like without it, take a peek at his content. It offers an interactive community where you can learn accessibility tips and connect with a community that shares your challenges and story.